Die Martis, 15° Martii 1831. Jackson to enter into a Recogce on Reddie's Appeal. Coleman's et al. Petition referred to Judges. Robertson v. Harford & Co.
L d Teignmouth's Petition claiming a Right to vote for Peers for Ireland, referred to Com ee for Privileges. 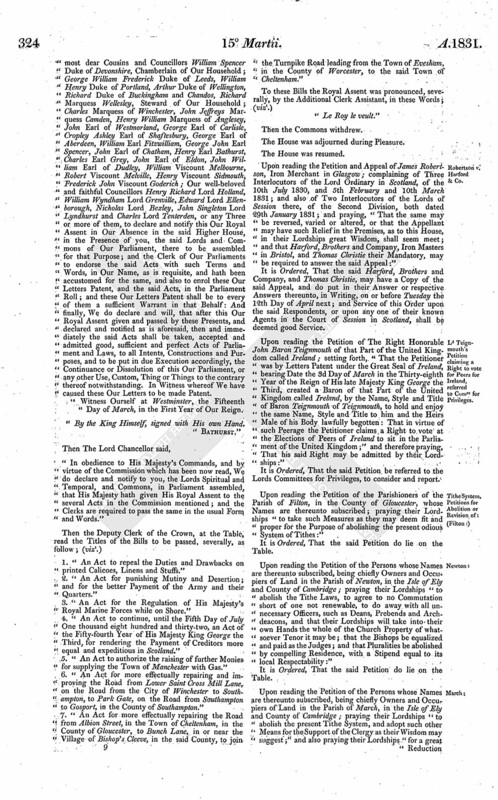 Metropolis Police Act, Petition from St. Luke's, Middlesex, for Repeal of. Coals carried Coastwise, Petition of Mayor, &c. of Waterford for Repeal of Duty on. Criminal Laws, Petition from Kirkby Kendal for Revision of. Worthing Road Bill, Petition against. Trustees of Bushell's Charity Petition referred to Judges. Perth Peerage, Petition for Com ee to meet. Sugar produced by Free Labour, Petitions from Carrickfergus & Lisburn for Repeal of Duty on. Canada Timber, Petition from Newcastle upon Tyne against Increase of Duty on. Agricultural Distress, Petition from Sussex respecting. Com ee on the Poor Laws, Simeon to attend. Trower's Divorce Bill, Smith to attend. The House being moved, "That Samuel Brown Jackson of New Inn, in the County of Middlesex, Gentleman, may be permitted to enter into a Recognizance for John Reddie, on account of his Appeal depending in this House, he living in Scotland:"
It is Ordered, That the said Samuel Brown Jackson may enter into a Recognizance for the said Appellant, as desired. It is Ordered, That the Consideration of the said Petition be, and is hereby referred to Mr. Justice Park and Mr. Justice Alderson, who are forthwith to summon all Parties concerned in the Bill, and, after hearing them, are to report to the House the State of the Case, with their Opinion thereupon, under their Hands, and whether all Parties, who may be concerned in the Consequences of the Bill, have signed the Petition; and also, that the Judges, having perused the Bill, do sign the same. It is Ordered, That the Consideration of the said Petition be, and is hereby referred to Mr. Baron Garrow and Mr. Justice Taunton, who are forthwith to summon all Parties concerned in the Bill, and, after hearing them, are to report to the House the State of the Case, with their Opinion thereupon, under their Hands, and whether all Parties, who may be concerned in the Consequences of the Bill, have signed the Petition; and also, that the Judges, having perused the Bill, do sign the same. Then Three of the Lords Commissioners, being in their Robes, and seated on a Form placed between the Throne and the Woolsack, The Lord Chancellor in the Middle, with The Lord Privy Seal on his Right Hand, and The Earl of Shaftesbury on his Left; commanded the Yeoman Usher of the Black Rod to signify to the Commons, "The Lords Commissioners desire their immediate Attendance in this House, to hear the Commission read." William the Fourth, by the Grace of God, of the United Kingdom of Great Britain and Ireland, King, Defender of the Faith; To Our right trusty and right well-beloved the Lords Spiritual and Temporal, and to Our trusty and well-beloved the Knights, Citizens and Burgesses, and the Commissioners for Shires and Burghs of the House of Commons, in this present Parliament assembled, Greeting: Whereas in Our said Parliament divers and sundry Acts have been agreed and accorded on by you Our loving Subjects, the Lords Spiritual and Temporal, and the Commons, in this Our present Parliament assembled, and endorsed by you as hath been accustomed, the Titles and Names of which Acts hereafter do particularly ensue; (that is to say,) "An Act to repeal the Duties and Drawbacks on printed Calicoes, Linens and Stuffs:" "An Act for punishing Mutiny and Desertion; and for the better Payment of the Army and their Quarters:" "An Act for the Regulation of His Majesty's Royal Marine Forces while on Shore:" "An Act to continue, until the Fifth Day of July One thousand eight hundred and thirty-two, an Act of the Fifty-fourth Year of His Majesty King George the Third, for rendering the Payment of Creditors more equal and expeditious in Scotland:" "An Act to authorize the raising of further Monies for supplying the Town of Manchester with Gas:" "An Act for more effectually repairing and improving the Road from Lower Saint Cross Mill Lane, on the Road from the City of Winchester to Southampton, to Park Gate, on the Road from Southampton to Gosport, in the County of Southampton:" "An Act for more effectually repairing the Road from Albion Street, in the Town of Cheltenham, in the County of Gloucester, to Bunch Lane, in or near the Village of Bishop's Cleeve, in the said County, to join the Turnpike Road leading from the Town of Evesham, in the County of Worcester, to the said Town of Cheltenham." And albeit the said Acts, by you Our said Subjects, the Lords and Commons in this Our present Parliament assembled, are fully agreed and consented unto, yet nevertheless the same are not of Force and Effect in the Law without Our Royal Assent given and put to the said Acts; And for as much as for divers Causes and Considerations We cannot conveniently at this Time be present in Our Royal Person in the Higher House of Our said Parliament, being the accustomed Place for giving Our Royal Assent to such Acts as have been agreed upon by you Our said Subjects, the Lords and Commons, We have therefore caused these Our Letters Patent to be made, and have signed the same, and by the same do give and put Our Royal Assent to the said Acts, and to all Articles, Clauses and Provisions therein contained, and have fully agreed and assented to the said Acts; Willing that the said Acts, and every Article, Clause, Sentence and Provision therein contained, from henceforth shall be of the same Strength, Force and Effect, as if We had been personally present in the said Higher House, and had openly and publicly, in the Presence of you all, assented to the same: And We do by these Presents declare and notify the same Our Royal Assent, as well to you the Lords Spiritual and Temporal, and Commons aforesaid, as to all others whom it may concern; Commanding also by these Presents Our well-beloved and faithful Councillor Henry Lord Brougham and Vaux, Our Chancellor of that Part of Our United Kingdom of Great Britain and Ireland called Great Britain, to seal these Our Letters Patent with Our Great Seal of Our United Kingdom of Great Britain and Ireland; and also commanding Our most dear Brothers and faithful Councillors Ernest Duke of Cumberland, Augustus Duke of Sussex, Adolphus Duke of Cambridge; Our most dear Cousin and faithful Councillor William Frederick Duke of Gloucester; The Most Reverend Father in God and Our faithful Councillor William Archbishop of Canterbury, Primate and Metropolitan of all England; Our well-beloved and faithful Councillor Henry Lord Brougham and Vaux, Chancellor of that Part of Our United Kingdom of Great Britain and Ireland called Great Britain; Our most dear Cousin and Councillor Henry Marquess of Lansdowne, President of Our Council; Our well-beloved and faithful Councillor John Lord Durham, Keeper of Our Privy Seal; Our most dear Cousins and Councillors William Spencer Duke of Devonshire, Chamberlain of Our Household; George William Frederick Duke of Leeds, William Henry Duke of Portland, Arthur Duke of Wellington, Richard Duke of Buckingham and Chandos, Richard Marquess Wellesley, Steward of Our Household; Charles Marquess of Winchester, John Jeffreys Marquess Camden, Henry William Marquess of Anglesey, John Earl of Westmorland, George Earl of Carlisle, Cropley Ashley Earl of Shaftesbury, George Earl of Aberdeen, William Earl Fitzwilliam, George John Earl Spencer, John Earl of Chatham, Henry Earl Bathurst, Charles Earl Grey, John Earl of Eldon, John William Earl of Dudley, William Viscount Melbourne, Robert Viscount Melville, Henry Viscount Sidmouth, Frederick John Viscount Goderich; Our well-beloved and faithful Councillors Henry Richard Lord Holland, William Wyndham Lord Grenville, Edward Lord Ellenborough, Nicholas Lord Bexley, John Singleton Lord Lyndhurst and Charles Lord Tenterden, or any Three or more of them, to declare and notify this Our Royal Assent in Our Absence in the said Higher House, in the Presence of you, the said Lords and Commons of Our Parliament, there to be assembled for that Purpose; and the Clerk of Our Parliaments to endorse the said Acts with such Terms and Words, in Our Name, as is requisite, and hath been accustomed for the same, and also to enrol these Our Letters Patent, and the said Acts, in the Parliament Roll; and these Our Letters Patent shall be to every of them a sufficient Warrant in that Behalf: And finally, We do declare and will, that after this Our Royal Assent given and passed by these Presents, and declared and notified as is aforesaid, then and immediately the said Acts shall be taken, accepted and admitted good, sufficient and perfect Acts of Parliament and Laws, to all Intents, Constructions and Purposes, and to be put in due Execution accordingly, the Continuance or Dissolution of this Our Parliament, or any other Use, Custom, Thing or Things to the contrary thereof notwithstanding. In Witness whereof We have caused these Our Letters to be made Patent. "Witness Ourself at Westminster, the Fifteenth Day of March, in the First Year of Our Reign. 1. "An Act to repeal the Duties and Drawbacks on printed Calicoes, Linens and Stuffs." 2. "An Act for punishing Mutiny and Desertion; and for the better Payment of the Army and their Quarters." 3. "An Act for the Regulation of His Majesty's Royal Marine Forces while on Shore." 4. "An Act to continue, until the Fifth Day of July One thousand eight hundred and thirty-two, an Act of the Fifty-fourth Year of His Majesty King George the Third, for rendering the Payment of Creditors more equal and expeditious in Scotland." 5. "An Act to authorize the raising of further Monies for supplying the Town of Manchester with Gas." 6. "An Act for more effectually repairing and improving the Road from Lower Saint Cross Mill Lane, on the Road from the City of Winchester to Southampton, to Park Gate, on the Road from Southampton to Gosport, in the County of Southampton." 7. "An Act for more effectually repairing the Road from Albion Street, in the Town of Cheltenham, in the County of Gloucester, to Bunch Lane, in or near the Village of Bishop's Cleeve, in the said County, to join the Turnpike Road leading from the Town of Evesham, in the County of Worcester, to the said Town of Cheltenham." Upon reading the Petition and Appeal of James Robertson, Iron Merchant in Glasgow; complaining of Three Interlocutors of the Lord Ordinary in Scotland, of the 10th July 1830, and 5th February and 10th March 1831; and also of Two Interlocutors of the Lords of Session there, of the Second Division, both dated 29th January 1831; and praying, "That the same may be reversed, varied or altered, or that the Appellant may have such Relief in the Premises, as to this House, in their Lordships great Wisdom, shall seem meet; and that Harford, Brothers and Company, Iron Masters in Bristol, and Thomas Christie their Mandatory, may be required to answer the said Appeal:"
It is Ordered, That the said Harford, Brothers and Company, and Thomas Christie, may have a Copy of the said Appeal, and do put in their Answer or respective Answers thereunto, in Writing, on or before Tuesday the 12th Day of April next; and Service of this Order upon the said Respondents, or upon any one of their known Agents in the Court of Session in Scotland, shall be deemed good Service. 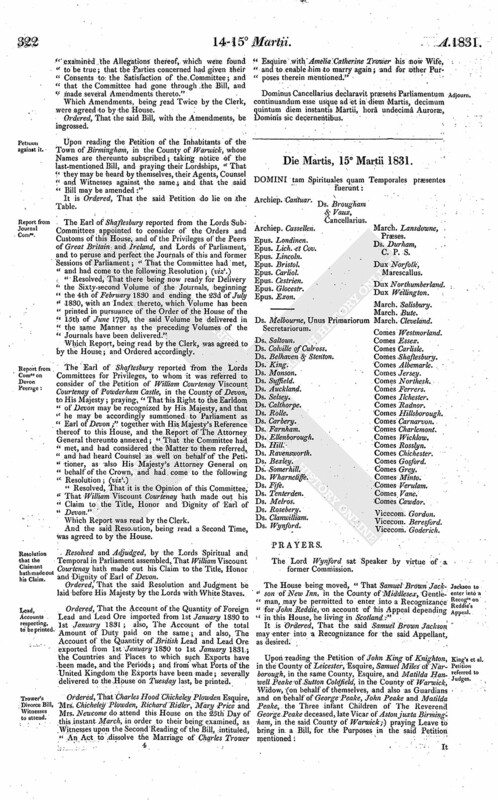 Upon reading the Petition of The Right Honorable John Baron Teignmouth of that Part of the United Kingdom called Ireland; setting forth, "That the Petitioner was by Letters Patent under the Great Seal of Ireland, bearing Date the 3d Day of March in the Thirty-eighth Year of the Reign of His late Majesty King George the Third, created a Baron of that Part of the United Kingdom called Ireland, by the Name, Style and Title of Baron Teignmouth of Teignmouth, to hold and enjoy the same Name, Style and Title to him and the Heirs Male of his Body lawfully begotten: That in virtue of such Peerage the Petitioner claims a Right to vote at the Elections of Peers of Ireland to sit in the Parliament of the United Kingdom;" and therefore praying, That his said Right may be admitted by their Lordships:"
It is Ordered, That the said Petition be referred to the Lords Committees for Privileges, to consider and report. 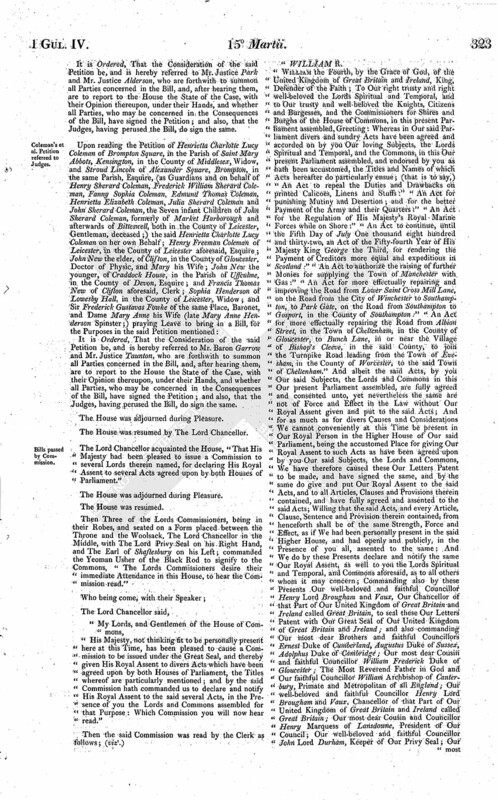 Upon reading the Petition of the Parishioners of the Parish of Filton, in the County of Gloucester, whose Names are thereunto subscribed; praying their Lordships "to take such Measures as they may deem fit and proper for the Purpose of abolishing the present odious System of Tithes:"
Upon reading the Petition of the Persons whose Names are thereunto subscribed, being chiefly Owners and Occupiers of Land in the Parish of Newton, in the Isle of Ely and County of Cambridge; praying their Lordships "to abolish the Tithe Laws, to agree to no Commutation short of one not renewable, to do away with all unnecessary Officers, such as Deans, Prebends and Archdeacons, and that their Lordships will take into their own Hands the whole of the Church Property of whatsoever Tenor it may be; that the Bishops be equalized and paid as the Judges; and that Pluralities be abolished by compelling Residence, with a Stipend equal to its local Respectability:"
Upon reading the Petition of the Persons whose Names are thereunto subscribed, being chiefly Owners and Occupiers of Land in the Parish of March, in the Isle of Ely and County of Cambridge; praying their Lordships "to abolish the present Tithe System, and adopt such other Means for the Support of the Clergy as their Wisdom may suggest;" and also praying their Lordships "for a great Reduction of Taxation, and for a complete, effectual and thorough Reform in the Commons House of Parliament:"
Upon reading the Petition of the Persons whose Names are thereunto subscribed, being chiefly Owners and Occupiers of Land in the Parish of Walsoken, in the County of Norfolk; praying their Lordships "to abolish the present Tithe System:"
Upon reading the Petition of the Landowners, Land Occupiers and Inhabitants of the Parish of Frampton Cotterell, in the County of Gloucester, whose Names are thereunto subscribed; praying their Lordships "to take the Tithe System into their most serious Consideration, and that they will devise Means for the Repeal of the Tithe Laws, and for the Introduction of some more equal and popular Mode of providing for the Clergy:"
Upon reading the Petition of the Owners and Occupiers of Land in the Parish of Gissing, in the County of Norfolk, whose Names are thereunto subscribed; praying their Lordships "promptly to adopt such Measures as may best remove the intolerable Burden of the Tithe Laws, under which the Petitioners in common with others have too long been groaning:"
Upon reading the Petition of the Owners and Occupiers of Land and other Inhabitants of the Parish of Cawston, in the County of Norfolk, whose Names are thereunto subscribed; praying their Lordships, "That the oppressive and injurious Tithe Laws may be altered by a Commutation either for a Portion of the Land or a Money Payment, to be made by the Landowners and not the Tenants, amounting not to One Tenth of the Produce of the Land, but to One Tenth of the Profits, which, in the Opinion of the Petitioners, would be a fair and equitable Adjustment, and then applied to its original Intention, the Maintenance of the Working Clergyman, the Repair of Churches and Relief of the impotent Poor:"
Upon reading the Petition of the Churchwardens, Overseers, Guardians of the Poor, Trustees and other Householders of the Parish of Saint Luke, in the County of Middlesex, whose Names are thereunto subscribed; praying their Lordships "to adopt such Measures as may be necessary for the Removal of the Metropolitan Police Force from this Parish, by the Repeal of the Act constituting such Force:"
Upon reading the Petition of The Mayor, Sheriffs, Aldermen and Common Councilmen of the City of Waterford, in Common Council assembled, under their Common Seal; praying their Lordships "to take into their Consideration the present heavy Duty upon Seaborne Coals, with a view to its total and immediate Repeal, and thus consult the Encouragement of the Manufactures and Industry, and thereby more effectually the Tranquillity and Prosperity of Ireland:"
And also, Upon reading the Petition of The Provost, Bailies, Councillors, Burgesses and others, Inhabitants of the Burgh of Bathgate, in the County of Linlithgow, whose Names are thereunto subscribed; severally praying their Lordships, "That the Plan proposed by His Majesty's Ministers for a Reform in the Representation of the People in the Commons House of Parliament may be passed into a Law:"
Upon reading the Petition of the Magistrates, Councillors and Inhabitants of the Royal Burgh of Dysart, whose Names are thereunto subscribed; praying their Lordships "to support His Majesty's Ministers in carrying into a Law the manly, efficient and comprehensive Measure of Parliamentary Reform brought into the Commons House of Parliament by His Majesty's Ministers:"
Upon reading the Petition of the Inhabitants of Swansea and its Neighbourhood, whose Names are thereunto subscribed; praying, "That their Lordships will give their Sanction to the Measures proposed for extending and amending the Elective Franchise, which they think cannot fail to be of the greatest Benefit to the British Nation:"
Upon reading the Petition of the Guild Stewards and Burgesses of the Borough of Calne, in the County of Wilts, whose Names are thereunto subscribed; praying, That their Lordships will be pleased to give their Support to such a Reform as will afford to the People a real and efficient Representation in the House of Commons:"
Upon reading the Petition of the Inhabitants of Glastonbury and its Vicinity, whose Names are thereunto subscribed; praying their Lordships "to introduce the most rigid Retrenchment and Economy in the Public Expenditure; to make such Alterations in the existing Laws as will secure to the People an efficient and equitable Representation in the Government; and in order to prevent the ruinous Expence to Candidates, and to secure to the Voters the fair and unbiassed Exercise of their Privileges, by shielding many of them from Intimidation and corrupt Influence, that their Lordships will introduce Vote by Ballot, and adopt such other salutary and judicious Measures as they shall deem proper:"
Upon reading the Petition of the Inhabitants of the Town and Parish of Frome Selwood, in the County of Somerset, whose Names are thereunto subscribed; praying their Lordships, "That the Measures for correcting the Defects which have been introduced by Time into the State of the Representation of this Country in the Commons House of Parliament may receive the Support of their Lordships:"
Upon reading the Petition of the Inhabitants of the Burgh of Kirkby Kendal, in the County of Westmorland, whose Names are thereunto subscribed; praying their Lordships "for a Repeal of the Punishment of Death for all Offences against Property:"
Hodie 3a vice lecta est Billa, intituled, "An Act to explain and amend an Act of the Sixth Year of His late Majesty King George the Fourth, as far as regards the Settlement of the Poor by the renting and Occupation of Tenements." Hodie 3a vice lecta est Billa, intituled, "An Act to enable the Governors of the Possessions, Revenues and Goods of the Free Grammar School of King Edward the Sixth, in Birmingham, in the County of Warwick, to erect a School House, Masters Houses and other suitable Accommodations for the said School, on a new Site in the Vicinity of the Town of Birmingham, and to extend the Objects of the Charity; and for other Purposes." Hodie 2a vice lecta est Billa, intituled, "An Act for amending and maintaining the Turnpike Road from and out of the Road leading from Quebec, in Leeds, to Homefield Lane End, in Wortley, to communicate with the Road leading from Huddersfield to Birstal at the Coach and Horses Public House in Birstal, in the West Riding of the County of York." L. Bp. Lichfield & Coventry. Hodie 2a vice lecta est Billa, intituled, "An Act for amending and maintaining the Roads from Stafford to Sandon, in the County of Stafford, and from Stafford, through Bridgford and Eccleshall, to Ireland's Cross near Woore, in the County of Salop, and from Bridgford aforesaid to the Stone which divides the Liberty of Ranton and Ellenhall in the Road between Bridgford and Newport, and from the Village of Knighton to the Turnpike Road leading from Stone to Woore aforesaid." Hodie 2a vice lecta est Billa, intituled, "An Act for amending and improving the Road from the Town of Stone to Gaol Gate in the Borough of Stafford, and from Green Gate in the said Borough, through Dunston and Penkridge, to Streetway Road, in the Road leading to Wolverhampton, in the County of Stafford." Hodie 2a vice lecta est Billa, intituled, "An Act for more effectually repairing and improving the Road from the City of Norwich to North Walsham, in the County of Norfolk." Hodie 2a vice lecta est Billa, intituled, "An Act for more effectually draining certain Fen Lands and Wet Grounds called the Great West Fen, in the Parish of Hilgay, in the County of Norfolk." 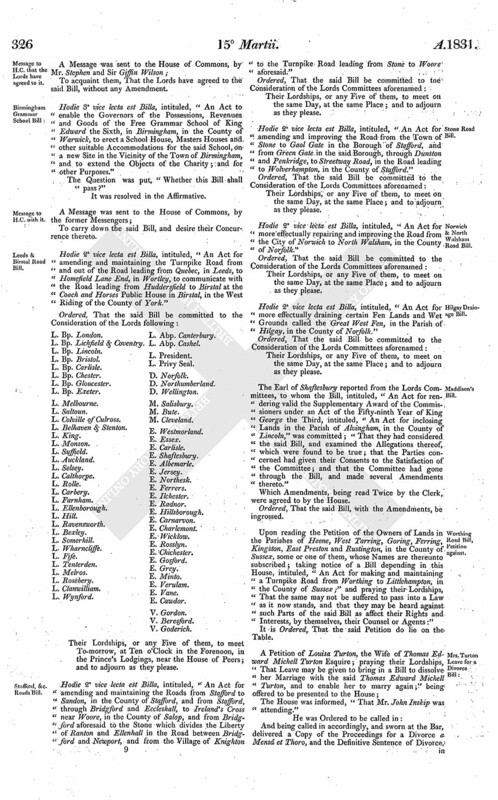 The Earl of Shaftesbury reported from the Lords Committees, to whom the Bill, intituled, "An Act for rendering valid the Supplementary Award of the Commissioners under an Act of the Fifty-ninth Year of King George the Third, intituled, "An Act for inclosing Lands in the Parish of Alvingham, in the County of Lincoln," was committed; "That they had considered the said Bill, and examined the Allegations thereof, which were found to be true; that the Parties concerned had given their Consents to the Satisfaction of the Committee; and that the Committee had gone through the Bill, and made several Amendments thereto." 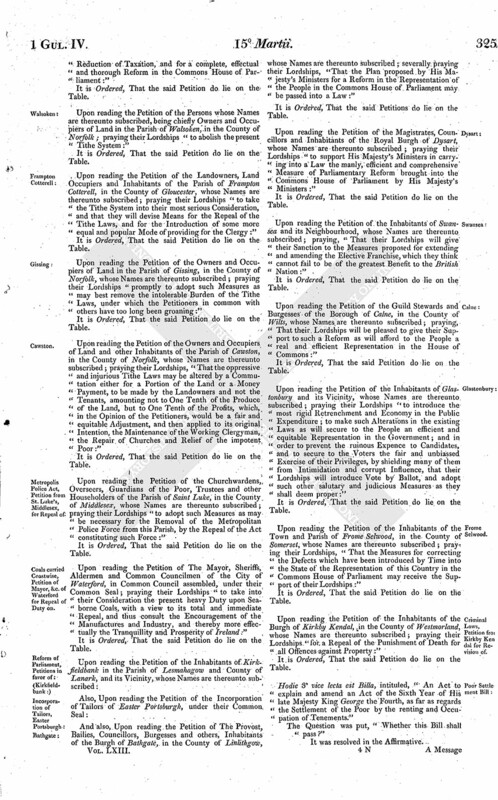 Upon reading the Petition of the Owners of Lands in the Parishes of Heene, West Tarring, Goring, Ferring, Kingston, East Preston and Rustington, in the County of Sussex, some or one of them, whose Names are thereunto subscribed; taking notice of a Bill depending in this House, intituled, "An Act for making and maintaining a Turnpike Road from Worthing to Littlehampton, in the County of Sussex;" and praying their Lordships, That the same may not be suffered to pass into a Law as it now stands, and that they may be heard against such Parts of the said Bill as affect their Rights and Interests, by themselves, their Counsel or Agents:"
The House was informed, "That Mr. John Inskip was attending." Ordered, That the said Proceedings and Sentence do lie on the Table. Then the said Petition was presented and read. Ordered, That Leave be given to bring in a Bill, according to the Prayer of the said Petition. Accordingly, The Earl of Shaftesbury presented to the House a Bill, intituled, "An Act to dissolve the Marriage of Louisa Turton with Thomas Edward Michell Turton her now Husband, and to enable the said Louisa Turton to marry again; and for other Purposes therein mentioned." Ordered, That the said Bill be read a Second Time on Wednesday the 30th of this instant March, and that Notice thereof be affixed on the Doors of this House, and the Lords summoned; and that the said Louisa Turton may be heard by her Counsel, at the said Second Reading, to make out the Truth of the Allegations of the Bill; and that the said Thomas Edward Michell Turton may have a Copy of the Bill, and that Notice be given him of the said Second Reading; and that he be at liberty to be heard by his Counsel what he may have to offer against the said Bill at the same Time. Ordered, That Louisa Turton do attend this House on Wednesday the 30th of this instant March, in order to her being examined upon the Second Reading of the Bill, intituled, "An Act to dissolve the Marriage of Louisa Turton with Thomas Edward Michell Turton her now Husband, and to enable the said Louisa Turton to marry again; and for other Purposes therein mentioned," if the House shall think fit, whether there has or has not been any Collusion, directly or indirectly, on her Part, relative to any Act of Adultery that may have been committed by her Husband; or whether there be any Collusion, directly or indirectly, between her and her Husband, or any other Person or Persons, touching the said Bill of Divorce, or touching any Proceedings or Sentence of Divorce had in the Ecclesiastical Court at her Suit, or touching any Action at Law which may have been brought by her against any Person for Criminal Conversation with her the said Louisa Turton's Husband; and also whether, at the Time of the Adultery of which she complains, her Husband was, by Deed, or otherwise by her Consent, living separate and apart from her, and released by her, as far as in her lies, from his conjugal Duty, or whether he was, at the Time of such Adultery, cohabiting with her. It is Ordered, That the Consideration of the said Petition be, and is hereby referred to Mr. Justice Littledale and Mr. Justice Bosanquet, who are forthwith to summon all Parties concerned in the Bill, and, after hearing them, are to report to the House the State of the Case, with their Opinion thereupon, under their Hands, and whether all Parties, who may be concerned in the Consequences of the Bill, have signed the Petition; and also, that the Judges, having perused the Bill, do sign the same. 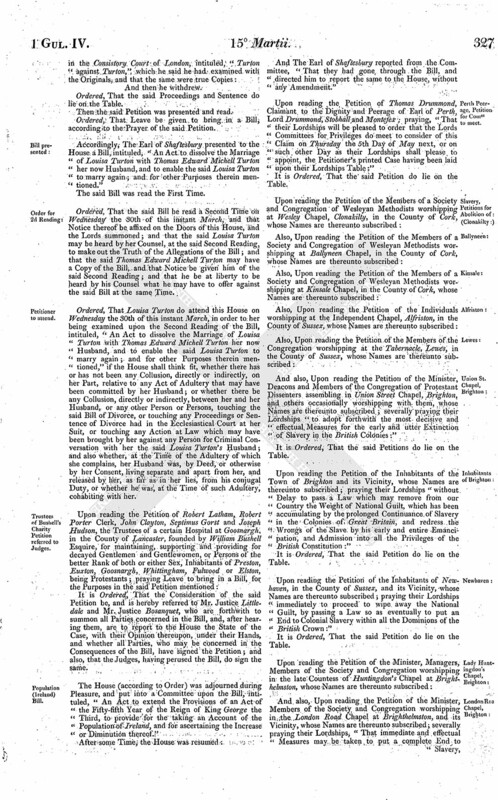 The House (according to Order) was adjourned during Pleasure, and put into a Committee upon the Bill, intituled, "An Act to extend the Provisions of an Act of the Fifty-fifth Year of the Reign of King George the Third, to provide for the taking an Account of the Population of Ireland, and for ascertaining the Increase or Diminution thereof." 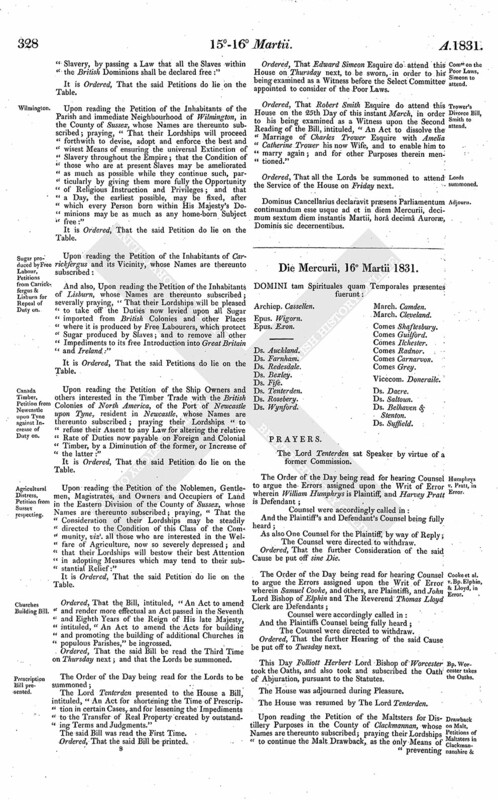 Upon reading the Petition of Thomas Drummond, Claimant to the Dignity and Peerage of Earl of Perth, Lord Drummond, Stobhall and Montefex; praying, "That their Lordships will be pleased to order that the Lords Committees for Privileges do meet to consider of this Claim on Thursday the 5th Day of May next, or on such other Day as their Lordships shall please to appoint, the Petitioner's printed Case having been laid upon their Lordships Table:"
And also, Upon reading the Petition of the Minister, Deacons and Members of the Congregation of Protestant Dissenters assembling in Union Street Chapel, Brighton, and others occasionally worshipping with them, whose Names are thereunto subscribed; severally praying their Lordships "to adopt forthwith the most decisive and effectual Measures for the early and utter Extinction of Slavery in the British Colonies:"
Upon reading the Petition of the Inhabitants of the Town of Brighton and its Vicinity, whose Names are thereunto subscribed; praying their Lordships "without Delay to pass a Law which may remove from our Country the Weight of National Guilt, which has been accumulating by the prolonged Continuance of Slavery in the Colonies of Great Britain, and redress the Wrongs of the Slave by his early and entire Emancipation, and Admission into all the Privileges of the British Constitution:"
Upon reading the Petition of the Inhabitants of Newhaven, in the County of Sussex, and its Vicinity, whose Names are thereunto subscribed; praying their Lordships immediately to proceed to wipe away the National Guilt, by passing a Law so as eventually to put an End to Colonial Slavery within all the Dominions of the British Crown:"
And also, Upon reading the Petition of the Minister, Members of the Society and Congregation worshipping in the London Road Chapel at Brighthelmston, and its Vicinity, whose Names are thereunto subscribed; severally praying their Lordships, "That immediate and effectual Measures may be taken to put a complete End to Slavery, by passing a Law that all the Slaves within the British Dominions shall be declared free:"
Upon reading the Petition of the Inhabitants of the Parish and immediate Neighbourhood of Wilmington, in the County of Sussex, whose Names are thereunto subscribed; praying, "That their Lordships will proceed forthwith to devise, adopt and enforce the best and wisest Means of ensuring the universal Extinction of Slavery throughout the Empire; that the Condition of those who are at present Slaves may be ameliorated as much as possible while they continue such, particularly by giving them more fully the Opportunity of Religious Instruction and Privileges; and that a Day, the earliest possible, may be fixed, after which every Person born within His Majesty's Dominions may be as much as any home-born Subject free:"
And also, Upon reading the Petition of the Inhabitants of Lisburn, whose Names are thereunto subscribed; severally praying, "That their Lordships will be pleased to take off the Duties now levied upon all Sugar imported from British Colonies and other Places where it is produced by Free Labourers, which protect Sugar produced by Slaves; and to remove all other Impediments to its free Introduction into Great Britain and Ireland:"
Upon reading the Petition of the Ship Owners and others interested in the Timber Trade with the British Colonies of North America, of the Port of Newcastle upon Tyne, resident in Newcastle, whose Names are thereunto subscribed; praying their Lordships "to refuse their Assent to any Law for altering the relative Rate of Duties now payable on Foreign and Colonial Timber, by a Diminution of the former, or Increase of the latter:"
Upon reading the Petition of the Noblemen, Gentlemen, Magistrates, and Owners and Occupiers of Land in the Eastern Division of the County of Sussex, whose Names are thereunto subscribed; praying, "That the Consideration of their Lordships may be steadily directed to the Condition of this Class of the Community, vizt. all those who are interested in the Welfare of Agriculture, now so severely depressed; and that their Lordships will bestow their best Attention in adopting Measures which may tend to their substantial Relief:"
Ordered, That the Bill, intituled, "An Act to amend and render more effectual an Act passed in the Seventh and Eighth Years of the Reign of His late Majesty, intituled, "An Act to amend the Acts for building and promoting the building of additional Churches in populous Parishes," be ingrossed. Ordered, That the said Bill be read the Third Time on Thursday next; and that the Lords be summoned. The Lord Tenterden presented to the House a Bill, intituled, "An Act for shortening the Time of Prescription in certain Cases, and for lessening the Impediments to the Transfer of Real Property created by outstanding Terms and Judgments." Ordered, That Edward Simeon Esquire do attend this House on Thursday next, to be sworn, in order to his being examined as a Witness before the Select Committee appointed to consider of the Poor Laws. Ordered, That Robert Smith Esquire do attend this House on the 25th Day of this instant March, in order to his being examined as a Witness upon the Second Reading of the Bill, intituled, "An Act to dissolve the Marriage of Charles Trower Esquire with Amelia Catherine Trower his now Wife, and to enable him to marry again; and for other Purposes therein mentioned." Ordered, That all the Lords be summoned to attend the Service of the House on Friday next. Dominus Cancellarius declaravit præsens Parliamentum continuandum esse usque ad et in diem Mercurii, decimum sextum diem instantis Martii, horâ decimâ Auroræ, Dominis sic decernentibus.